The history of motorcycles (and scooters) is full of examples of chimera and hybrids — vehicular analogs of mythological combinations of species such as centaurs, mermaids and griffins. From turn-of-the-century motorized bicycles and Gottlieb Daimler’s first motorcycle to the Honda Supercub, Vespa V50 Pedalo and modern machines such as the Gilera GP800, there have always been vehicles that defied simple categorization. Forgetting the OEMs, there are the non-production customs such as Vespa choppers, vintage scoots outfitted with sportbike engines, scooters on skis, chopped and welded Ruckuses and anything those with the parts, skills and vision can create. The desire to combine two disparate qualities with the hopes of creating something that shares the qualities of both is understandable. The results often wind up simply splitting the difference, creating something average rather than exceptional. A Yorkie Poo, not a pegasus. BMW Motorrad is clearly hoping for the latter with the C 600 Sport and C 650 GT, the company’s first production scooters in a decade. Its previous scooter offering, the C1, was itself an oddball hybrid — 125cc or 176cc Rotax-engined scoot enclosed by a windshield and roof. Reception to the C1 was mixed, sales poor, and production ceased after less than two years. (It was never even sold in the United States, though a handful made their way in from Europe and Canada.) BMW has had other successes combining aspects of different vehicles, though. In the ’50s, they re-engineered the Isetta microcar (which became the first car to achieve 71 mpg) using four-stroke single-cylinder engines from the R25 motorcycle. In the early ’80s, they adapted a 4-cylinder Peugeot car engine to create the groundbreaking K75 and K100 motorcycles. It doesn’t take much imagination to see the C-series scooters’ heritage. Unlike the experimental C1, the C 600 Sport and C 650 GT look, feel and perform like mature, fully-realized vehicles benefitting from almost a century of BMW design and engineering experience. They share many features with the company’s motorcycles, but with scooter-like step through (or at least step over) architectures, rear-mounted engines and upright riding positions. Many scooter enthusiasts have fallen down the rabbit hole of pondering and debating the nature of the C-series: what it is, its intent, and who it’s built for. I’ll admit to my share of head scratching. These scooters are easy to admire from both aesthetic and engineering standpoints, but in a world with motorcycles and scooters, what’s the point of something that, no matter how BMW chooses to label it, is kind of both but neither? At first glance, how are you even supposed to get on? Yet once you’ve mounted, with engine revving and nothing but open road ahead, all the preconceptions and doubts melt away and the BMW C-series’ purpose becomes apparent. These machines are built for riders, and to be ridden. It’s not so complex after all. Just as BMW’s automobile division claims to build “The Ultimate Driving Machine,” BMW Motorrad boasts that they offer “The Ultimate Riding Machine.” While that’s obvious hyperbolic marketing speak, when riding the scooters, I couldn’t help but think that the engineers in Berlin had this ideal in mind when designing the C-series. Though no vehicle can be everything to everyone, these scooters are surprisingly versatile and adept to tackling a variety of uses while meeting the needs of a great many riders. Another of the company’s tag lines, “Sheer Driving Pleasure,” is not far off the mark either. My review methodolgy was simple: I started with the C 600 Sport and after more than a month, swapped it for the C 650 GT. During this time, I lived with these BMWs day-to-day and rode them as my only sources of transportation. I logged more than 1,500 miles between the two, putting them through the best and worst of what Southern California has to offer. This included daily commutes through Los Angeles traffic, long rides along the coast and through the twisty canyons of the Santa Monica mountains, snaking through gridlock, and cruising on superslab freeways. I rode the hell out of them, just like I do with my own scooters, and then some. Despite naming conventions, both the C 600 Sport and the C 650 GT are propelled by the same 2-cylinder 647cc engine with 60 hp and reported top speeds of 109mph. That may actually be a tad conservative. These scooters are undeniably fast and powerful, brimming with torque and power. Like most scooters with CVT (automatic) transmissions, there’s an initial hesitation when accelerating off the line as the engine revs up and the transmission begins to engage. After a steady start, from about 15mph on these BMWs are off like bullets, or, more accurately, a decent 650cc motorcycle. When lane splitting on the C-series (this is California, after all), the scooter had no difficulty pulling away from traffic at lights, leaving cars as shrinking specks in the rear view mirrors. The C 600 Sport and C 650 GT have curb weights (meaning fully loaded, gas tank full, sans rider) of 549lbs and 575lbs respectively, but in motion, you don’t feel a bit of that. They are surprisingly agile. I spent several days riding them in the canyons near and around Malibu, some of the most famous and beloved twisty roads in the country. I’d worried that sort of riding on a scooter this size might be exhausting — that I’d feel every pound as I wrestled to tilt it through snakes and hairpins. Instead, the C 600 Sport in particular had me close to weeping with joy as I leaned through the curves with ease and confidence at unprecedented (for me) speeds. My fellow scooter riding buddies were all a bit taken aback as well, and commented on my sharp lean angles and zip. A friend on a Suzuki Burgman 400 reported that he simply couldn’t keep up once we got into the tight curves. Only so much of that can be attributed to power. After all, you can only go so fast through those types of turns on any scooter. On my comparatively small Vespa LX, I often keep up with much larger scooters in the curves. The BMW’s advantage is its handling — tall wheels, great suspension and a well-balanced design. CVT transmission scooters have a few inherent drawbacks when it comes to freeway riding. When braking or decelerating, the throttle is released, the engine coasts and the transmission spins down. This is the equivalent of going from fifth gear to second gear. There is no neutral, no way to drop it into fourth and hold it there. Many freeway-capable scooters (including some in the 200cc-500cc range) often struggle to quickly accelerate back to full speed. Many who’ve ridden a smaller scooter at wide open throttle for a sustained distance have experienced a transmission that eventually hits its limits. Breaking a drive belt at 60 mph can ruin your day. One obvious solution: a really big engine. Because BMW’s too sophisticated to settle for brute force, they’ve paired a powerful engine with a fast transmission that delivers power evenly on demand. Need to accelerate at 75mph to pass a truck? No problem. Need to slow to let a car merge into lanes, the get back up to speed, quick? Easy. Both models have adjustable windshields (electronic on the C 650 GT, three-position manual on the C 600 Sport) and both are a welcome feature when fully tilted up, particularly in the cold and rain. Tucking down behind the shield at speed is like being wrapped in cone of silence. All you hear is the sound of your wheels on the road. Not quite a knee-dragger, but the handling and lean angles on the BMW scooters should please most riders. My first outing on the C 600 Sport was in rush hour traffic. I stuck to the crowded surface streets, took my time with bike and got familiar with it. So my initial impression wasn’t of the power or the handling. When I got home, the first thing I reported to my wife was, “That thing has amazing brakes!” The BMW’s triple disc brakes are immodestly brag-worthy. They’ve got more than enough stopping power, but also very smooth and not “grabby.” Once I was able to do more technical riding, I discovered that despite they’re power, it was still easy to drag the rear brake a little for excellent control in tight turns. Both models come standard with ABS for 2013, though it’s possible that lower-priced versions without this may come in future model years. The ABS caught me by surprise a couple times when it kicked in. When engaged, the ABS moderates how the brakes are applied rapidly engaging and releasing them. This is felt in the rear brake handle, which seems to shudder. Perfectly normal, as I learned, and how ABS is supposed to function. Fortunately, while that shuddering is felt at the lever, the actual application of the brake itself still feels smooth. That shudder became reassuring when making hard stops in heavy traffic. Good to know it’s a powerful brake and that the system works. However, the first couple times I experienced the ABS was when decelerating from high speeds during normal riding situations. This had me questioning whether it was how I was braking or if the system was kicking in when it wasn’t needed. Better safe than sorry, I suppose, and it certainly didn’t affect my ability to decelerate and stop. The dimensions and weight of the BMW C-series scooters are never more apparent than when trying to move one at slow speeds. All the engineering and the gyroscopic effects that keep you upright while in motion are of no help when parking, backing the scooter up, getting it on and off the stand and even moving in very slow traffic. The physical specs of the scooters exceed some similar and larger-displacement motorcycles. A BMW F 700 GS, for example, is 110 lbs lighter than the C 650 GT scooter. The C 650 Sport eclipses a Vespa P200 and a pair of GTSs and is larger than many motorcycles at the Rock Store, a popular biker stop. That said, the size and weight aren’t impossible to deal with. Many riders smaller than I am easily contend with taller and heavier bikes. 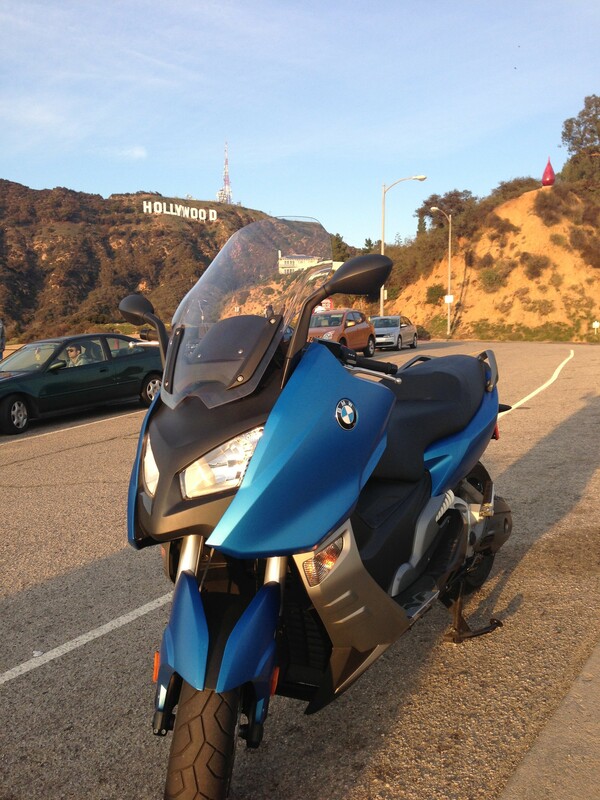 I met a petite woman, several inches shorter than I am, who has put a lot of miles on the BMW C-series. She told me she recently rode one from Tucson to Los Angeles. She’s an experienced motorcyclist, though, and seemed accustomed to dealing with large bikes. It takes practice and caution. I expect a lot of new owners to drop their BMWs when parking or losing footing while backing up or moving the scooter. In the moment when your foot slips off the stand or you momentarily lose your balance, you have to be ready to stabilize over 500 lbs of toppling scooter. Getting the scooter on the center stand became easier with practice, but on inclines and uneven surfaces, the less stable side stand had to suffice. 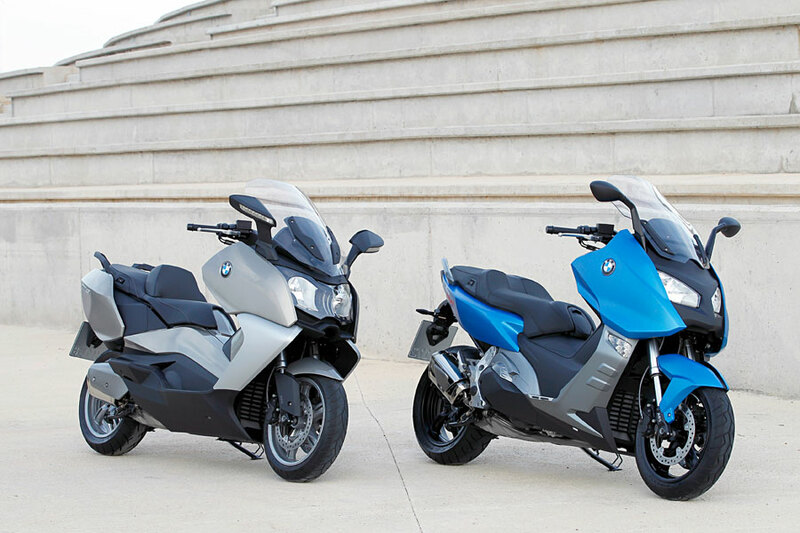 Though kickstands and side stands are often a bad idea on smaller scooters — which tend to roll off them all too easily — it’s a necessity on the BMWs for anyone not built like Shaq. I eventually adopted a set routine when parking. Stop, hit the kill switch, drop the side stand (which also stops the engine), climb off, tilt scooter up, take a deep breath, place it on center stand. Done. The effort required to handle the scooters did occasionally became tiresome, particularly on the C 650 GT, with its slightly taller, wider seat and bigger rear end. The touring model’s differences from the C 600 Sport, though small, were enough to make daily riding and parking in the narrow allotments at my workplace more of a chore. To get my feet flat and stable, I had to slide forward on the seat, which diminished my leverage and balance. Returning to my sub-300 lb, 150cc scooters was an affirmation of all the reasons I love something smaller for daily riding and commuting. If I need to squeeze my Vespa in or out of a tight space, I can lift the back end of the scooter. At other times, the dimensions of the BMWs made common tasks a little inconvenient. On smaller scooters, I can easily reach over the headset to open the gate to my driveway. On the BMWs, I had to park, dismount, open the gate, get back on the scooter, restart it and ride it in. That’s a small inconvenience in the grand scheme of things, but people accustomed to doing something simple quickly and easily often get frustrated when that task becomes more time consuming. 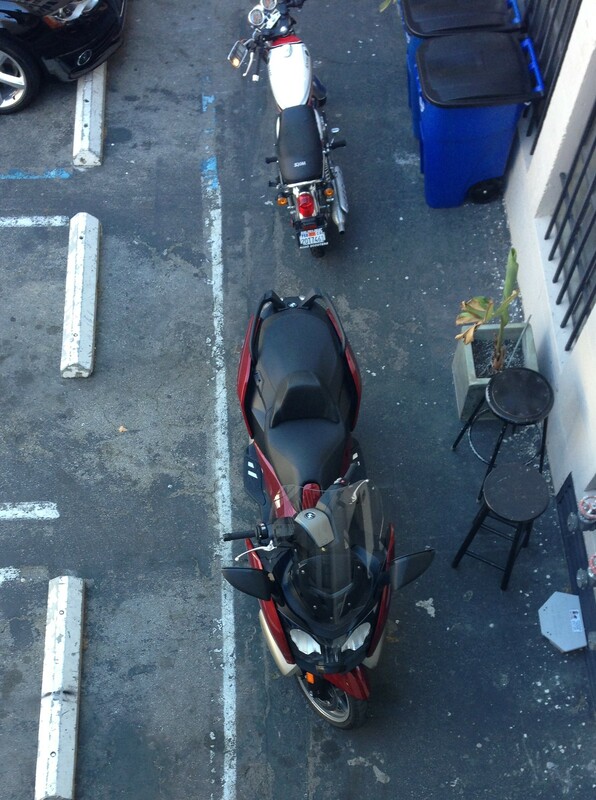 Finding that small, hidden parking space or even parking inconspicuously (where I’m probably not supposed to) was more difficult with the larger, more visible scooter. The C 600 Sport and C 650 GT are, aside from their numerical designations, aptly named and seem to live up to their designations as a sport or touring model respectively. Underneath the bodywork, they’re identical twins. On the outside, they’re siblings that have very different goals in life and very different senses of style. The most substantive differences between the two are the shape and structure of the seats. Sitting on them and riding them, what may seem like a minor variation profoundly affects the riding experience. How and to what degree they affect your riding experience will depend on your riding style and physical proportions, but it must be emphasized that these two bikes are significantly different to ride. The seat heights for both BMW scooters are tall, both over 31″. This is about 2″ taller than a Suzuki Burgman or Honda Silverwing and about the same as the 489 lb Yamaha T-Max 500. The 69.7″ inner leg curve — which accounts for seat width as well as height — rivals many of BMW’s large motorcycles. Those motorcycles often have adjustment options or accessories to lower them. At the moment the BMW scooters do not, but low seat options are on the way from BMW. Maneuvering the C 650 GT in and out of this office parking area wasn’t always easy. With my 30″ inseam, I often struggled when moving the BMWs around. I could plant both feet flat on level ground, but was on my toes when backing up. The height wasn’t much of an issue when stopping in traffic, but not nearly as easy as on a traditional motorcycle with a similar height but narrower body and a lower, further forward center of gravity. The tall seats do have a benefit when riding, however. They improve the handling and particularly on the C 600 Sport, provide a more aggressive seating position than cruisers and touring bikes. Sitting upright on the BMWs, many riders may be taller than most cars and even some SUVs. This vantage point offers a lot of advantages. The seats on both scooters encourage this upright riding position. They may share the heart of a sport bike but they’re still scooters. When riding, you likely won’t be able to drop down into full tuck with your knees in your armpits — at least not for very long and not without looking slightly ridiculous. The C 600 Sport, with its longer, flatter seat, allows for more variations. When riding aggressively or on technical curves, I found that sliding back and leaning forward slightly gave me better balance and more confidence when I leaned. On long rides, I liked to move around a lot on the seat to keep my back from getting stiff or sore. The C 650 GT, with its built in lower-back support, is less flexible. Those who prefer sitting straight or leaning back, extending their legs in a more recumbent style, may prefer this. As expected, the C 650 GT’s seat is more suitable for touring. Many will prefer it, but I found the seat a bit confining. In situations similar to those where I’d slide back on the C 600 Sport, I didn’t feel as well-balanced on the C 650 GT. The result, I suppose, was that I rode the GT less aggressively most of the time. Another strike against the GT seat for commuters is that the backrest interferes with riding with a backpack or messenger bag. Every day I carry a 25-liter backpack loaded with a 17″ laptop, various hard drives, cases, tools, etc. The divider forced me to sit further forward on the seat than I generally like. With a messenger, shortening the straps was of some help, but still not entirely comfortable. When commuting on the GT, I eventually started stashing the backpack in the under-seat storage. It’s nice to have that amount of space, but that’s not the safest way to carry a laptop. Your body does a better job of absorbing shocks and vibration than anything on the scooter. It’s worth noting that another lucky rider who had long-term BMW loaners told me he had the exact opposite preference in which seat (and which C-series model) he preferred. The reasons he liked the GT better were pretty much the same as the reasons I favor the Sport. For many potential buyers, these seats might be the deciding factor between which model they ride away from the dealer. The price difference between the two is a mere $400, not enough to affect the decisions of many buyers ready to spend around $11 grand after taxes, fees, etc. So if you’re in the market for one of these bikes, make sure you get seat time in both. Despite their differences in shape, both C-series seats are well cushioned and comfortable enough for many hours of uninterrupted riding. With the exception of height challenges, these scooters should be suitable for a broad range of riders. I highly recommend spending some time sitting on both models, riding them if possible, before making a buying decision. If you’ll be carrying a passenger, have someone come and sit behind you on the seat and spend longer sitting on it than you think you need to. For us, the seats are the big difference between the C 600 Sport and C 650 GT, and outweigh the other differences such as styling and storage capacity. Of course, while having a comfy seat is nice, having a comfy, heated seat is BMW. The heated seat is currently a standard feature on both models. Combined with the heated grips, riding on very cool (mid-30s) and sometimes wet mornings and nights was relatively enjoyable, rather than a personal endurance challenge. The heated seats and grips each have multiple heat settings, including automatic activation when the temperature drops. As expected, heat from the grips doesn’t radiate out well, but toasty palms and chilly knuckles still beat freezing hands. The overall ergonomics of both scooters are undeniably well thought out. From the placement of footrests to the width of the handlebars, I had no trouble coming from scooters with headsets on the handlebars to the BMWs and their bars affixed to a large, immobile fairing. I had feared a loss of sensation — less of a connection with the wheels and the road. This was unfounded. Part of the ease in getting comfortable riding the BMW is the layout of the controls on the handlebars. When switching between my Vespa and my Stella, it sometimes takes a while for me to get used to the different placement of the controls (horn, turn signals, kill switch, etc.). On the BMW, no thought was required because everything is exactly where it should be. It feels natural and effortless. Even on my first ride, I never fumbled to find a switch. The one ergonomic challenge I did face on a daily basis was getting on and off the scooter. The tunnel (space between the seat and the back of the leg shield) is high. Stepping over it is possible, maybe, if you’re exceptionally long-legged. Most humans would have to sort of half-mount the scooter or sit side saddle and swing their right leg over. My preferred method was simply swinging my leg over the back of the seat, as I’d mount a motorcycle. This was difficult on the GT (that damned backrest/divider again) and on both scooters I managed to rake my boot across the upholstery at least a couple times. It’s easy to see how someone could actually damage the seat this way. The third method for getting on the scooter was this: With the bike securely on the center stand on a level surface, hold the front brake, place left foot on the floorboard, then stand up straight. As this will both seem a bit goofy to onlookers and possibly call unwanted attention to your unusual scooter mounting method, you need to own the situation. Pump your fist triumphantly in the air while shouting, “Sküter Fahrvergnügen!” (or something similarly Germanic-sounding) then swing your right leg over and sit on the scooter. Get it started and off the stand, then peel away before anyone knows what’s going on. The downside to method three is the increased likelihood of falling off or knocking the scooter over while making a public display. Use with discretion. The number of thoughtful details and features packed into the BMW C-series underscores the company’s commitment to building bikes that compete at the high end of the market. In this case, while creating a new class of scooter: the luxury sport maxi. The closest competitor in the US is the Suzuki Burgman 650 Executive, a very good scooter with a similar MSRP, but it’s much more touring-oriented than sport. The forthcoming Aprilia SRV850 (a reworking of the Gilera GP800) qualifies as a “luxury sport maxi” more due to its 830cc engine and high price tag than actual features. 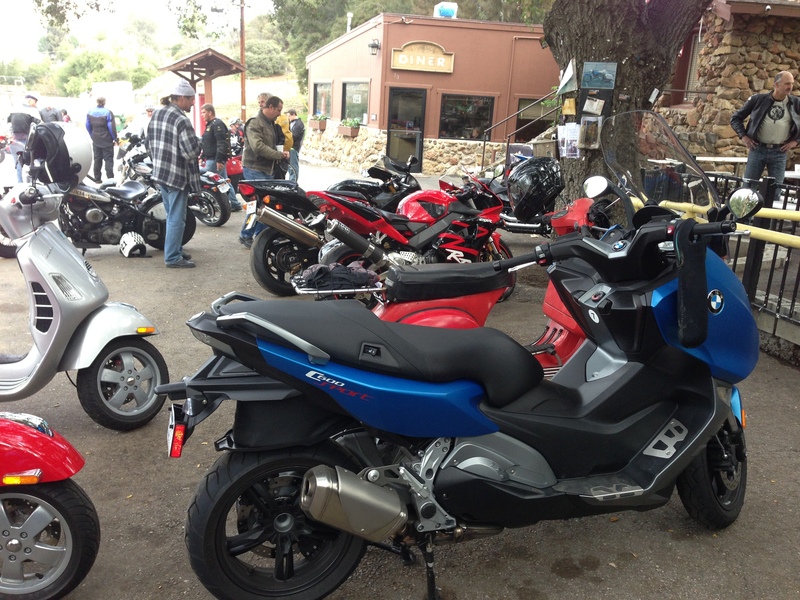 Like the BMW, the SRV850 borrows a lot of styling and engineering from sport bikes, but the Aprilia lacks heated seats, adjustable windshield, storage capacity, ABS and other amenities. The BMW C-series’ onboard computer and gauges provide a wealth of information, including average fuel economy and consumption, tripmeters, average speed and a tire pressure monitoring system. The speedometer is an analog display. 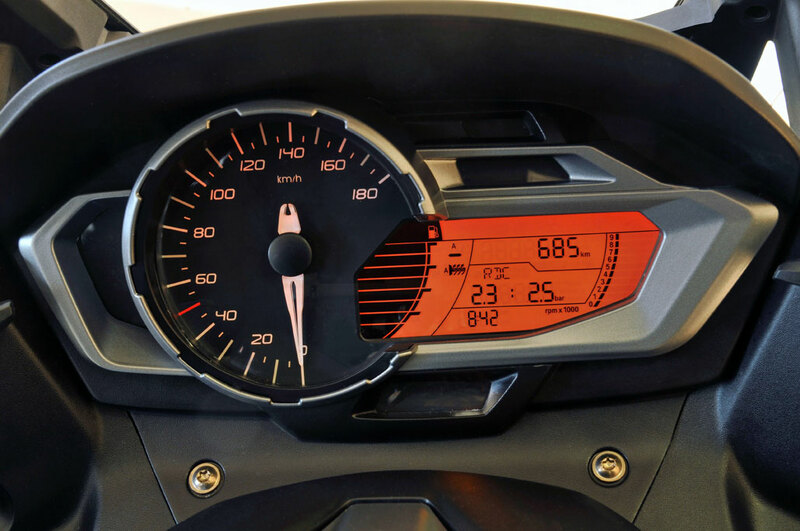 The LCD screen next to the speedo is flanked on the left by the fuel gauge, and on the right by the tachometer. In between, all the info from the computerized system is accessible by a switch on the left handlebar. I found the C 600 Sport’s instrumentation a little more difficult to read while riding than the C 650 GT simply because of the colors and the typeface for the numbers. This wasn’t much of an issue once I learned where the various readouts are on the display. Both the LCDs are a bit tougher to read at night despite backlighting, and would benefit from more colors or better organization of the information. The fuel gauge is as accurate as any motorcycle, though I didn’t test it by running either scooter out of fuel. The tank holds 4.2 gallons, meaning that on the street you’ll probably run dry after consuming around four. I averaged 42-45 mpg in mixed riding on both models, which is pretty in line with the reported fuel economy of 42-53 mpg at constant speeds of 56mph and 75mph respectively. This definitely gives the BMW the edge over the Burgman, Silver Wing, and several other 500+ cc maxis. In general, I ended up fueling up less often than when riding my 100 mpg Stella 4t (with a tank half the size of the BMW’s). The large tank capacity gave me a lot of confidence when riding up into the web of roads through the national forests with no gas stations for miles. Unique to the C-series is a parking brake activated by the side stand. When the stand is lowered, both wheels are locked into place, preventing the scooter from rolling off. As previously mentioned, lowering the stand also shuts off the engine. Most of the time, this was useful. I’m still distrustful of kickstands, though, and usually just used it while mounting and dismounting before putting the scooter on the center stand. Problem is, this can’t be done while the wheels are locked. In one instance, I had pulled over on a twisty downhill road to take photos. The scooter was pointed downhill (no other way to pull over on the narrow roadway) and on an uneven and slippery surface of loose dirt and gravel. I put the kickstand down, climbed off, studied the situation for a moment. Squeezing the front brake and holding the grab rail, I kicked up the side stand. Getting it on the center stand would require coordinating releasing the front brake (which was keeping it from rolling forward), then applying as much strength and leverage as I could muster to rock 550 lbs up onto the stand without losing my footing. After a handful of aborted attempts, exhausting myself by wrestling with the scooter, I became fearful of dropping it and realized that I was probably doing more to endanger the bike than setting it on the kickstand for a few minutes would. For what it’s worth, that center stand is very stable. There’s ample storage in both models for most helmets as well as gear, accessories or groceries. 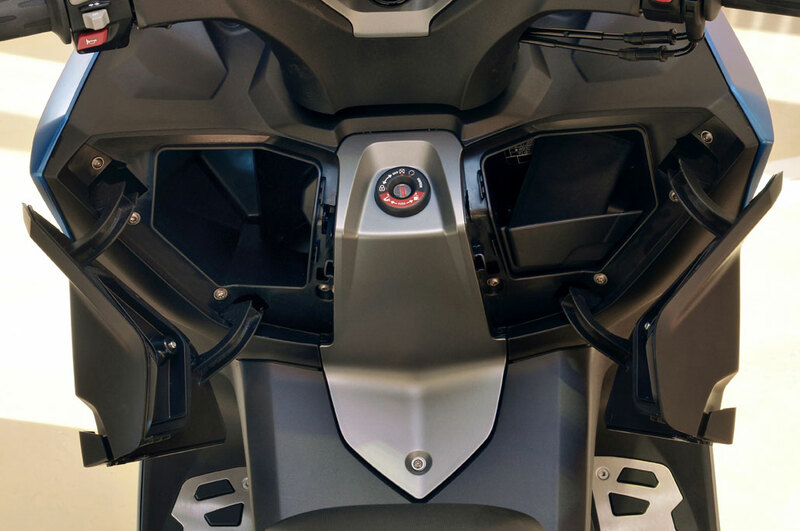 The BMW C 600 Sport has a unique feature to allow stowing a helmet under the seat when parked. It’s an expandable compartment called the Flexcase. I was a bit skeptical when I first read of this and saw photos of it but in practice, it’s well-implemented. When parked, a latch in the underseat storage expands the Flexcase, which could easily accommodate my XL and even XXL modular helmets. When the Flexcase is deployed, the scooter ignition is disabled to prevent dragging it on the rear wheel when moving. This is practical but took some getting used to. I often forgot to close the Flexcase before mounting the scooter and was forced to get off and pop it back into place before I could go anywhere. The C 650 GT, with its wider rear end, has more overall storage space but no Flexcase. Unfortunately, while I could fit my big helmets in the Sport, I couldn’t in the GT’s space, which can only hold two small open face helmets. When riding, however, the extra space for gear and groceries came in handy. 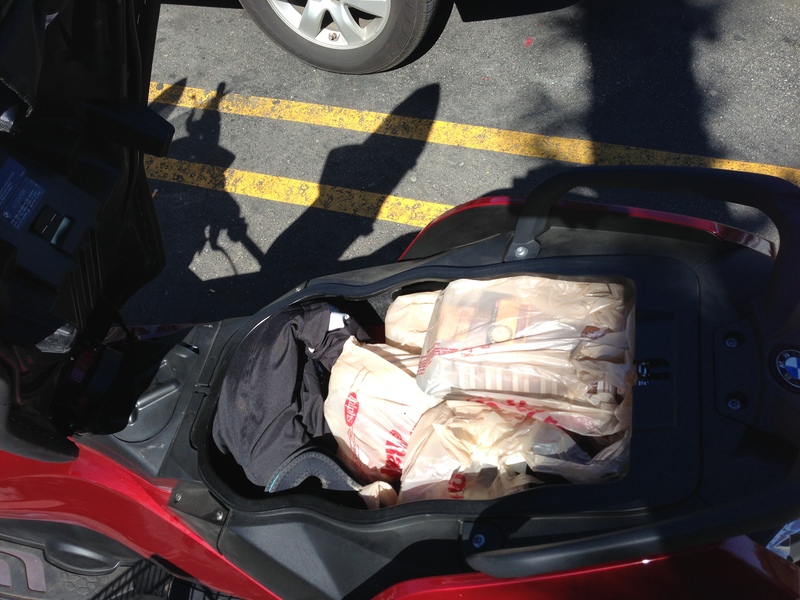 Stashed in the BMW C 650 GT storage: four bags of groceries and a riding jacket. For those who need more than the under-seat storage can provide, a color-matched top case is already available for the C-series scooters. 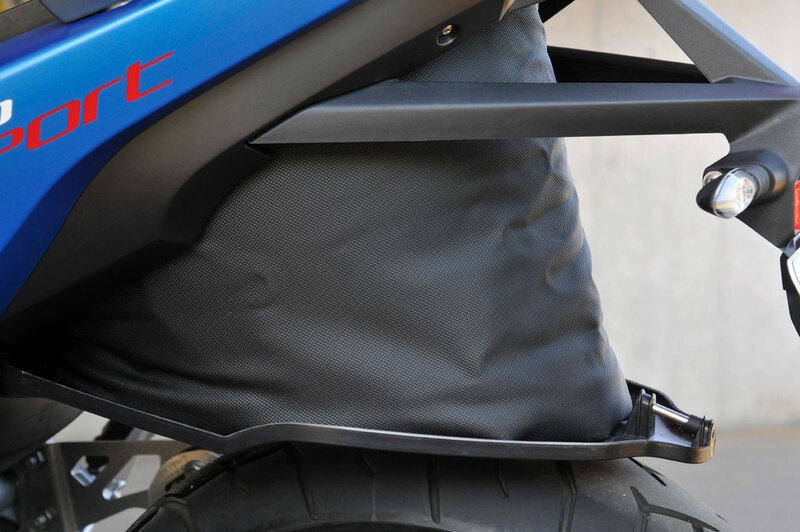 Unfortunately, BMW has no plans for hard panniers or saddlebags, but the aftermarket will no doubt fill that gap. Both models also have in-dash storage up front, with a long, narrow space on the left (perfect for gloves and a hat) and a small space with a tray on the right (great parking passes, garage door openers, house keys). For no apparent reason other than possibly just to be different, these bins open vertically on the C 600 and out to the sides on the C 650. Both bins lock with the ignition as well, providing some convenient, secure storage for small items. After successfully employing them a couple times in the past to stop engines when crashing, I’ve become a big advocate of kill switches. On manual transmission scooters and motorcycles, the engine will often stall when the clutch is released. A CVT will typically run until shut off. It’s not uncommon for riders to accidentally twist the throttle when trying to get up from a crash or even a minor drop. With an engine this powerful, that could be disastrous. On the BMWs, the starter button doubles as a kill switch: press down to start the engine, up to stop it. This is convenient much of the time. The switch is located right where your thumb wants it to be on the right handlebar. Still, I’d advise any C-series owner to use the switch to shut the scooter off as much as possible, until that “up” action is burned into muscle memory and becomes automatic. If you ever need it, you won’t want to hunt for it. The lighting on both scooters is excellent. The C 650 GT beats its sporty sibling in this category however, with front turn signals up high on the rearview mirrors and distinctive LED running lights in the headlight cluster. Those used to riding scooters with headlights on the handlebars shouldn’t be concerned about the fixed headlights on the BMWs. The beams are wide and bright, providing plenty of visibility when turning. When the scooter isn’t running, there’s a front parking light that automatically shuts off after a short time when the key is removed. This proved useful when pulling into my dark driveway and carport and removing my gear. There’s also a handy light in the under-seat storage. The 12V power outlet may be a little too out of the way for some uses. 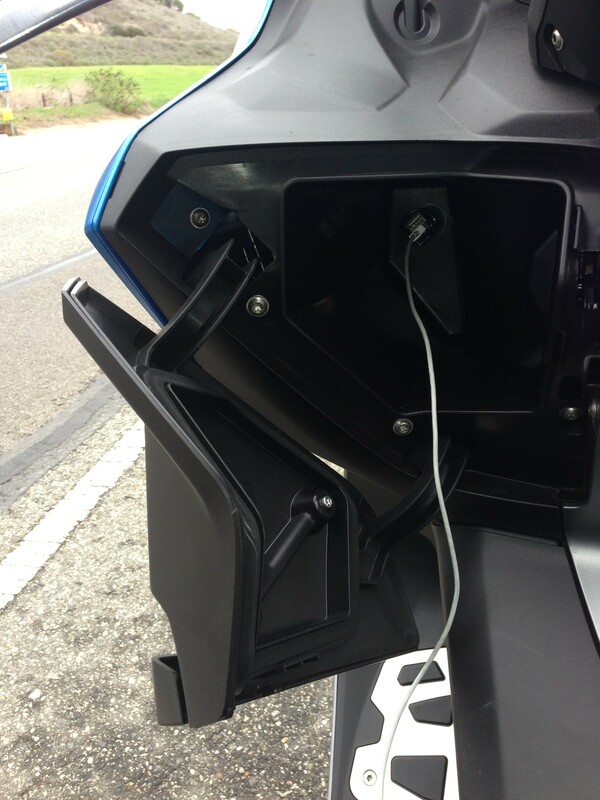 Power outlets (12V) are becoming standard on many models these days, and given BMW owners’ stereotypical penchant for accessorizing their rides, it’s a “must-have” on these scooters. Unfortunately, the 12v socket is squirreled away inside the front left glove compartment with no practical way to run a cable through the door. I’m sure this is because having an outlet on the outer bodywork would sully the scooters’ sleek exteriors, though probably no more so than mounting a GPS, iPhone and portable weather station to the dash. Still, I identified a couple locations an outlet could discreetly be added provided anyone’s willing to drill a 1.25″ hole in an expensive body panel. Adding those accessories may be a challenge, or at the very least pricey. There are few surfaces or rails where a standard RAM or other common accessory mount might safely attach. (The brake fluid reservoir is one possibility.) BMW is offering a variety of OEM mounting brackets, but they’re gonna cost you. 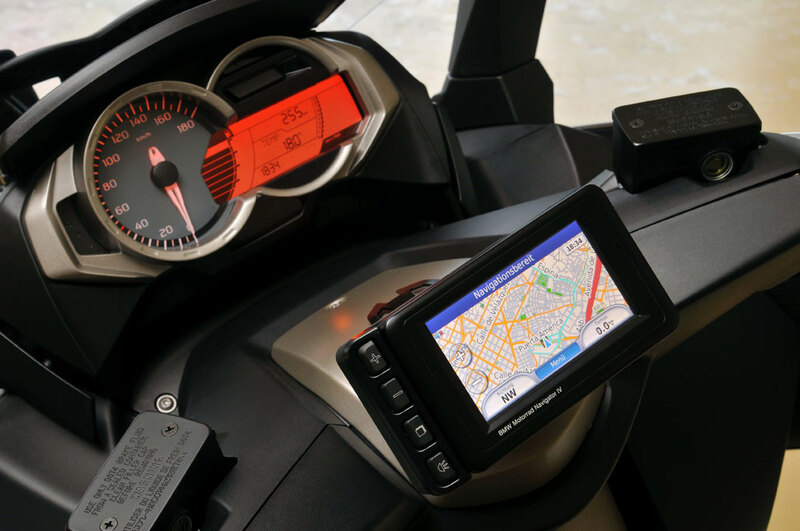 The one I’ve seen in person is the mount for a BMW-exclusive Garmin GPS unit that’s positioned on the top of the steering column, where the roundel is located on the handlebars. The mount (which may have been a pre-production version) appeared a bit crude and, more importantly, places the GPS somewhere that’s difficult to see without taking your eyes off the road. There are some places elsewhere on the dash where the plastics are bolted in that can hopefully provide stable locations for future third-party mounts. The C 600 Sport and C 650 GT currently come standard with the Highline package. Both are available without the package, but given the overwhelming demand for these features, don’t expect your local BMW dealer to stock the bare-bones model. They just don’t sell. It’s a good value package, however. The Highline includes not just the heated seats and grips but also an anti-theft alarm system. Many potential buyers may be worried about the cost of owning a BMW. Some of this is actually an exaggeration, but it would be prudent to compare shop labor rates at the dealer with other makes. The BMWs come standard with a 36-month warranty. Yamaha, Suzuki, Piaggio and Honda only offer a one-year. According to the owner’s manuals, they require maintenance once a year after the first break-in service unless excessive (unspecified) miles are put on the scooters. It’s quite possible that, depending on where you live and the labor rates, BMW ownership may not be as inaccessible as some may assume. Outside of warranty, depending on where you live, you may have an independent shop available to you to help keep your C-series scooter in good condition for less. That’s not to say that these scooters are flawless, but finding fault feels a bit like nitpicking. Few as they were, most of my complaints with the C-series scooters were unavoidable. I wouldn’t consider any of them flaws. They’re just compromises inherent to what these bikes are: big, heavy maxiscooters. Most are compensated for in other ways, such as a high seat height in trade for better riding position and handling. I’ll take the superior handling and happily tolerate the seat height. The first clear design flaw is the door that covers the gas cap. If it’s open — while stopped at a filling station, for instance — and you also open the seat, you’ll break the door. This is already a common occurrence and already understood by BMW. In fact, it was pointed out explicitly during the BMW press launch presentation. it’s an easy enough thing to be aware of, but it’s an obvious design flaw that simply shouldn’t be that way. Look for that to change in subsequent model years. The in-dash storage is useful, but the doors and hinges are a bit underwhelming. Second, the doors to the in-dash storage on both models feel a bit loose and flimsy. Both the latches and hinges for these seem a bit loose and like they might break easily. I used these compartments often and didn’t manage to break them, but on a scooter this refined, I expected something that feels a bit tighter and more solid. Third, as mentioned above, the LCD displays could use some improvement. Fourth, audible turn signals would be a nice addition. At this point, the nitpicking gets pretty petty. BMW and other powersports companies have become fond of the term “Urban Mobility” to describe their efforts to create vehicles designed for the global transportation challenges of the future. As envisioned by BMW, that future is one in which energy prices continue to rise, sprawl consumes large chunks of Europe and Asia (as it has already done in the US), cities become more densely populated, streets become more crowded, and well-heeled commuters will be seeking alternative ways to get around. Several other companies are also investing in developing new vehicles and technologies to address these issues; Piaggio has opened an Advance Design Center in California for this very purpose. 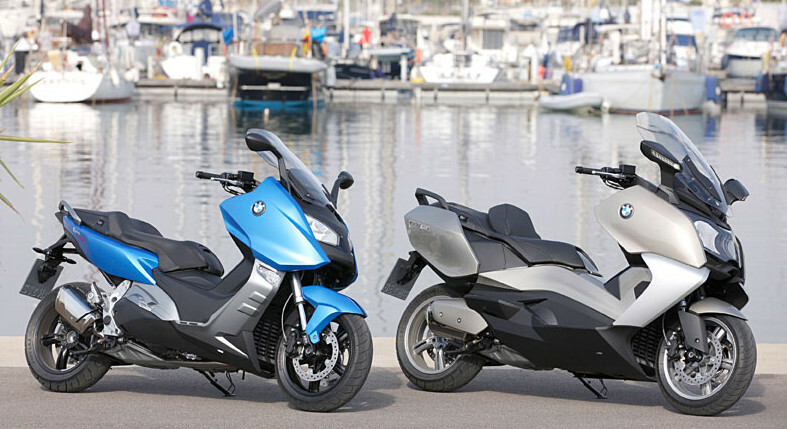 For BMW Group, the Motorrad division is actually a “center of competence” for Urban Mobility. How the whole company (including the automobile division) approach getting around cities in the future will be informed by knowledge gleaned within Motorrad. It wouldn’t surprise us if BMW were to even think smaller and more urban in the future. But less speculatively, the upcoming BMW i3 city car will actually have a range extending engine borrowed from Motorrad. Details are as yet unrevealed, but for all we know, it could be a version of the very engine found in the C-series scooters. Though it may make less sense to those of us in the US — American scooterists often lament that the rest of the world has very different attitudes about transportation and more widely-regards scooters as viable options — there’s a logic to using scooters as a launchpad for a new generation of vehicles. They’re relatively easy to ride, cheap to build and highly efficient. They also play well with other forms, an ideal partner for the sort of hybridization and mixing and matching that gave birth to the BMW C-series. Solving “Urban Mobility” challenges will require a wide range of vehicles to address the myriad worldwide differences in urban planning, transportation and energy policies, government regulations, wealth distribution and cultural attitudes. 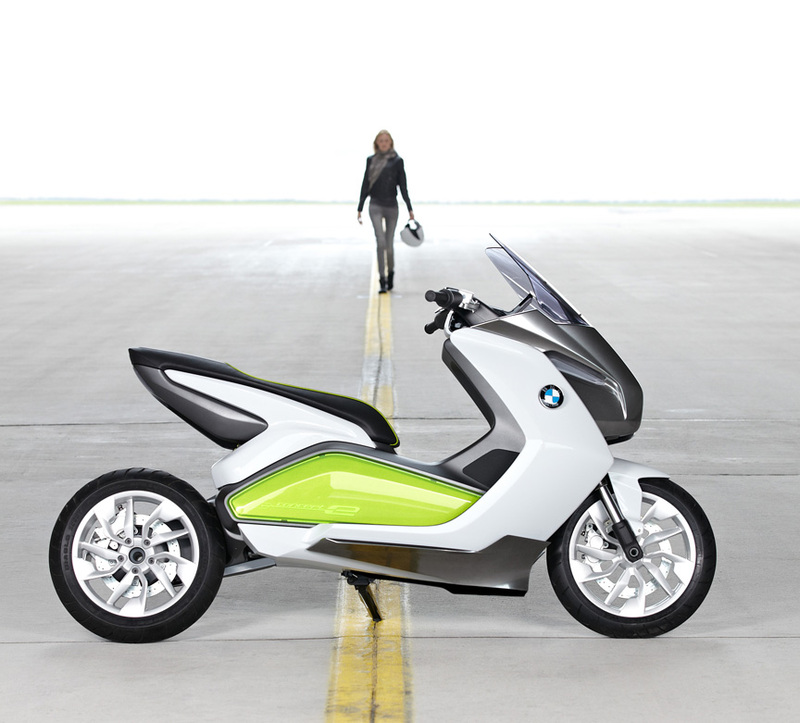 The next step for BMW Motorrad is the C-Evolution, an all-electric version of the C-series, due in 2014. Having such an established and respected company make a bold commitment to electric scooters could be the tipping point many have anxiously awaited. BMW’s leadership in these segments could influence other companies to bring some of their more promising concepts to production. The Great Leap Forward? BMW’s electric Concept E will go into production as the C Evolution in 2014. 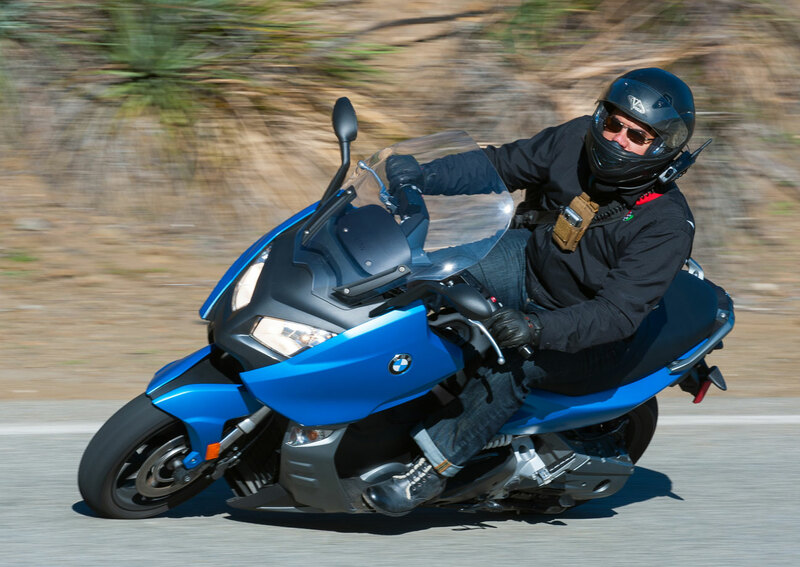 In the here and now, the BMW C 600 Sport and C 650 GT are welcome alternatives for those considering motorcycles or other maxiscooters to meet their needs — both as recreational vehicles and for daily riding. They’re well-built, high-quality machines that are versatile and suitable for riding in most conditions. In fact, the C-series scooters may be a better fit for many riders than bikes they might otherwise be thinking about. They’re more convenient than most midsize motorcycles, but more capable than most big scooters. Though C-series bikes are positioned at the top end of the price scale for scooters, their value is more than the status that comes with that famous blue and white roundel. The combination of performance and features is fairly competitive, all things considered. There are cheaper models available, but these are luxury vehicles and that luxury comes at a fairly modest price all things considered. There are some caveats, however. Neither these nor other bikes in their class are the best options for new riders. A common misconception is that larger, more powerful scooters are somehow “safer” than smaller scooters. I’ve frequently heard this from riders who are over 55 or so and purchased large maxiscooters as their first bikes. I’ve also seen a handful of them trapped under their maxiscooters when they’ve fallen, often when parking or stopping their bikes. If the appeal is a larger, more comfortable seat, there are many more sensible and manageable choices. The BMWs pack a lot of power. 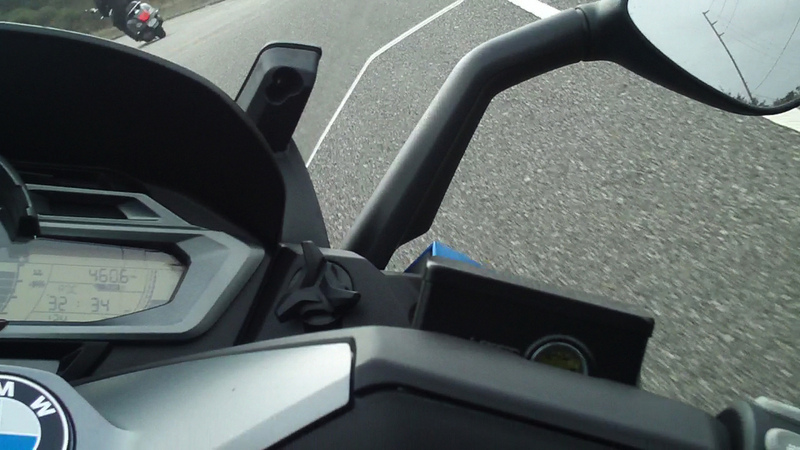 Small, accidental twists of the throttle could be disastrous. When riding the BMWs, I was often asked (once I admitted than I didn’t actually own them) if I’d buy one. Assuming that I had more than $11,000 (after various charges, taxes and fees are applied to the MSRP) and intended to spend the money on a single vehicle, the only question remaining would be which BMW model I’d buy. For most, the key factors in making that choice will primarily be comfort, personal preference and whether they frequently ride with passengers. Personally, I’d happily purchase and ride the BMW C 600 Sport, but primarily as a second vehicle for touring and recreational riding. Most of my daily riding is urban commuting on some of the most congested thoroughfares in the country. My weeks on the BMWs, as fun-filled and pleasurable as they were, renewed my appreciation for small, quick (but not necessarily fast) scooters that are easier to handle in tight spaces. If I was in the unfortunate position of only being able to own one scooter, the BMWs wouldn’t be the best choice for my particular circumstances regardless of budget. A slightly smaller, lower-displacement version would have me considering trading in something from my modest stable. That said, if a motorcycle or maxi makes sense for you and your riding, the BMW C-series scoots are an impressive option. If you’re willing and able to spend the money, you’re sure to enjoy the ride. For more images of the BMW C 600 Sport and C 650 GT, including tests to determine how much will fit in the storage, visit our gallery. While hanging around at ScooterWorks Chicago during the launch event for the Genuine Stella 125 Automatic, something blue and white in the corner of the show room caught my eye. What I saw was one of the rumored Genuine Buddy Brit special edition 170is.